I am inspired by Spring's tap-tap-tapping on my windows. I am awakened and invited to deeply stretch my snoozing muscles. I was invigorated today by a visit to Collecting Leaves, where LadybugZen was sporting a lovely new picture in her sidebar, entitled "Green Hour... No Child Left Inside." While I am stirred by the idea, and charmed by nature journals, I don't feel that we (my family)can or should commit to someone else's lesson plan. Our explorations and discoveries of nature are always of a more distracted and enchanted sort. We never know when they shall begin, and certainly we can never guess upon what tulip we shall dance, or which moonbeam we shall come to land. We have books about how to sketch nature. We have charts for the night skies. 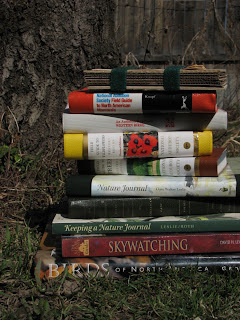 We tote around our heavy field guides during our trips to the forest. We have bug-catching nets and various boxes to temporarily house our new little friends. We own well-used magnifying glasses and enjoy our paint sets and artist boxes. We are intrigued by others' fieldtrips, and neighborhood jaunts. We always wonder "what's at the top of this hill?" We have a compost heap, grow vegetables, love eating tomatoes-off-the-vine, and warm raspberries-off-the-cane. We turn over stones to look for centipedes and roly-polies. We climb trees and dig in the dirt. We stomp rambunctiously on the earth, but we also eagerly sit nose-to-screen in front of the television when something interesting and wild can be seen and studied up close. We are biologists, excavators, explorers, zoologists, horticulturists, fishermen, and herb gatherers. We love the earth, and respect its creatures. We know that it is important to cherish life. Along these lines I am thinking to begin a Growing Naturally list of blogs. A group of families who are committed to seeing their children growing up in the sunshine (and snow and wind and rain), knowing of nature, and most importantly, encouraging their children to explore and discover themselves naturally. 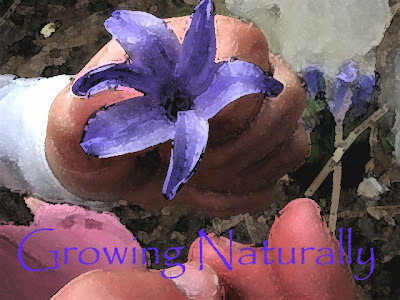 Learning naturally, exploring naturally, and growing naturally. Sharing ideas, sharing resources, and sharing stories. I wonder if anyone would be interested? I may be coming down your way in a few weeks. Email me at hopelesscook at yahoo.com if you want to meet up. I would be interested...if I could get Z out and about more. He's kinda in a homebody mode. He apparently doesn't sense how extremely bored I am. Tara - :) How very unaccomodating of him!